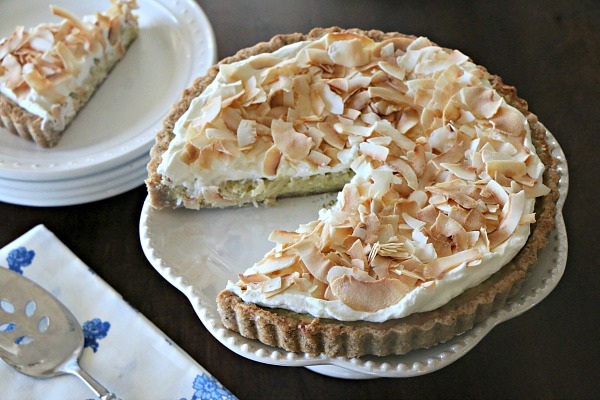 A rich and creamy Coconut Custard Tart with a Toasted Almond Crust. Here’s the thing: I love pie. You know that I love pie. 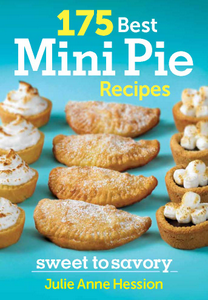 I wrote a cookbook that contains 175 different pie recipes, something that simply cannot be done unless you have a true passion for pie. But, sometimes, less is more. Take pie filling, for example. There are times when I feel like the filling-to-pie ratio is a tad overwhelming, whether it’s too much cream, too much fruit or too much custard. I love a good slice of Mississippi Mud or Banana Cream just as much as the next girl, but I can rarely finish the deep dish versions all by myself. That’s where the tart comes into play. The tart is the neater, the more civilized, and the more filling-to-crust ratio-friendly cousin of the pie. 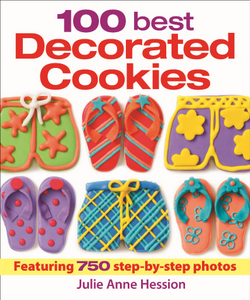 In my opinion, it’s also the better choice for ending a big holiday feast, as it can be sliced into pretty, small wedges to accompany coffee. 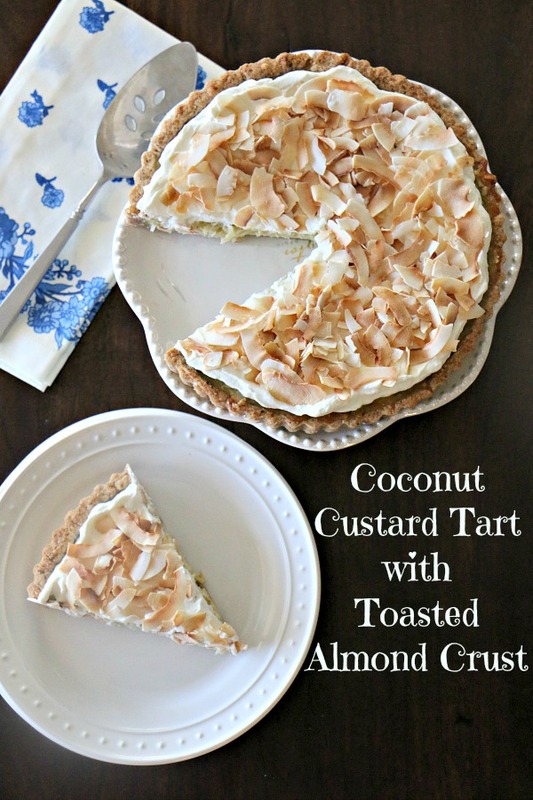 I love the flavor combination of coconut and almond (I’m looking at you, Almond Joy), which inspired the toasty, nutty crust for this tart—a crust that is very forgiving and easy to work with. I also like the idea of making a coconut custard tart for a big, labor-intensive meal as opposed to a coconut cream tart. Why? I’m so glad you asked. 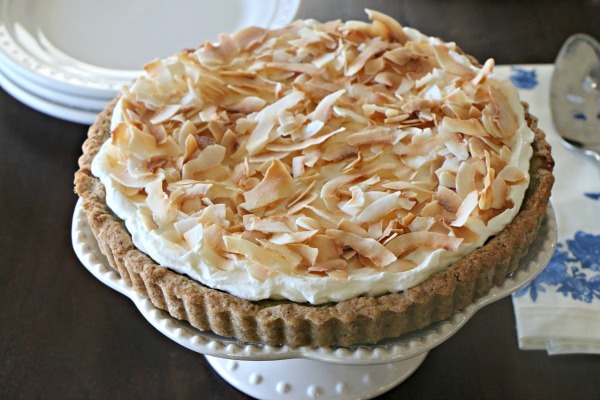 The coconut cream tart filling is a bit more involved, usually requiring several steps and many different bowls in order to make the silky coconut-goodness that ultimately fills the tart shell. This coconut custard filling is more streamlined, and it comes together in just a fraction of time required for its coconut cream counterpart. 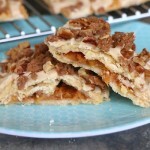 It also has more texture, from both the coconut in the filling and the golden, crunchy toasted coconut curls that adorn the top. 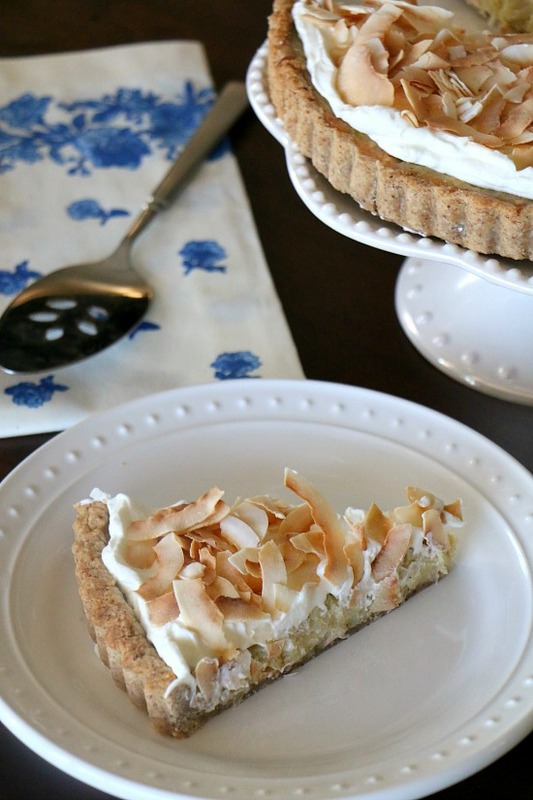 This beautiful coconut tart would be the perfect ending to an Easter celebration or any springtime dinner party. 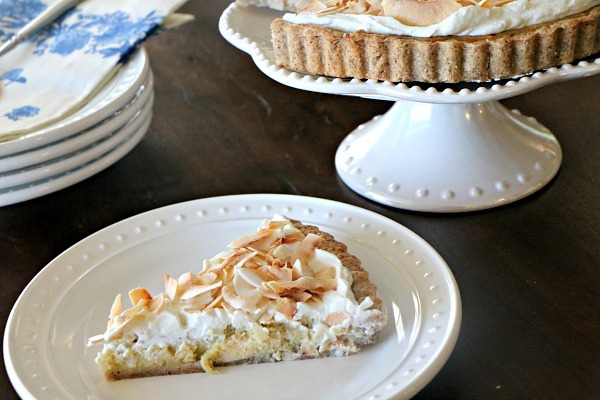 The toasted almond crust serves as a nice complement to the creamy filling topped simply with whipped cream and golden coconut curls. Combine the flour, ground almonds/almond meal, sugar and salt in the work bowl of a food processor and pulse several times to blend. Scatter the butter pieces over the flour mixture and pulse until the mixture resembles coarse meal. Gradually add the ice water, pulsing, until moist clumps start to form. Turn the dough out onto a lightly floured work surface and knead a few times to bring it together. Form the dough into a flat disk, wrap it in plastic wrap, and chill it for at least two hours or overnight. Preheat the oven to 400F degrees. On a lightly floured work surface, roll out the dough into a circle about 3/16-inch thick. Carefully transfer the dough to a 9 or 10-inch tart pan (depending on what you have), trimming the edges and evening out the sides. Freeze 30 minutes. Blind bake the crust: Place the tart pan on a baking sheet and line it with foil so that there is a 2-inch overhang on all sides. Fill the inside of the crust with pie weights, dried beans or rice. This will help the crust to maintain its shape as it bakes. Bake the crust 15 minutes, then carefully remove the foil and pie weights. Poke several holes in the bottom of the crust and return it to the oven until it is dry, set and lightly golden brown, 10-12 minutes. Lower the oven temperature to 350F degrees. In a large bowl, whisk together the eggs, sugar, vanilla, salt and nutmeg. Heat the coconut milk in a medium saucepan until it just begins to bubble around the edges. Whisking constantly, gradually add the hot coconut milk to the egg mixture in a slow, steady stream. Whisk in the cream and the coconut. Place the baking sheet containing the tart crust on the center rack of the oven. Pull out the rack, and carefully pour the custard filling into the tart crust, filling it as close as you can to the top. Carefully, push the rack back into the oven, doing your best to not fill any of the filling. Bake the tart until the custard is set around the edges but still jiggles slightly in the center, 30-40 minutes. Cool completely. 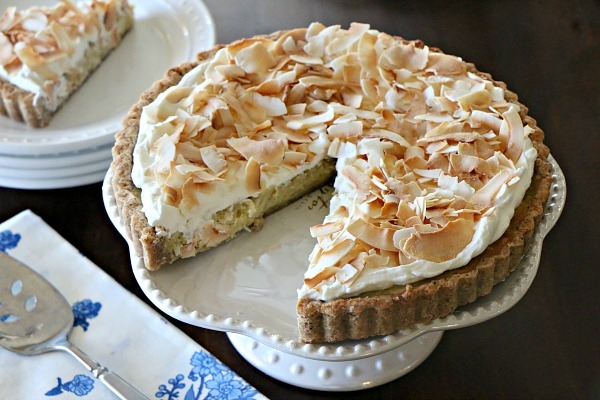 Just before serving, spread the whipped cream over the tart and sprinkle it with the toasted coconut. Serve room temperature or chilled. This tart is fantastic. 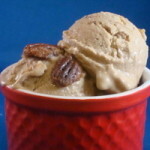 It’s light and has a nice subtle sweetness. 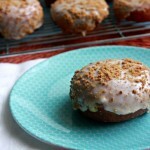 The creamy custard is perfectly sandwiched between the addictive almond butter crust and toasted coconut. I’ll definitely be making this again. 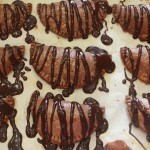 Such a mouth-watering recipe! Awesome!